The renowned landscape architect, Charles Jencks, has created another post-mining masterpiece, this time in Scotland. Such works provide valuable lessons for landscape restoration and post-industrial regeneration. 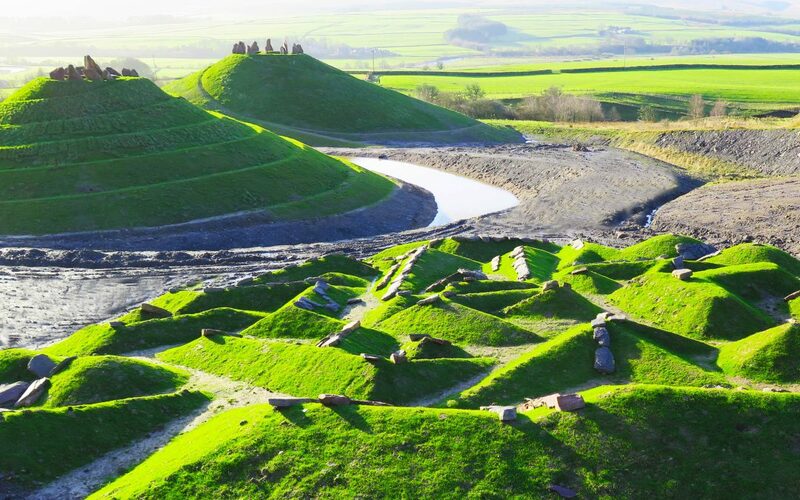 After his work on a Northumberland coal and clay mine waste site to produce the arresting topography of The Lady of the North – Northumberlandia, Jencks has constructed an entire universe – the Crawick Multiverse – on an abandoned coal mine site in Dumfries and Galloway. The recently-completed project encourages visitors to explore the universe, re-born from the geological skeleton of a mine into various interconnected sculptures and landforms that tell a mind-blowing story. The story is told in the BBC Earth article, The Place Where You Can Walk Through the Universe. Such projects are important as they can inspire those involved with the mining industry (and beyond) to more diverse and creative ideas for building new cultural, environmental and socio-economic values from old mine sites. Images kindly supplied by Crawick Multiverse.